Chips: so good. Cover them with cheese: even better. Put more delicious things on top of those chips covered in cheese: give me this forever. 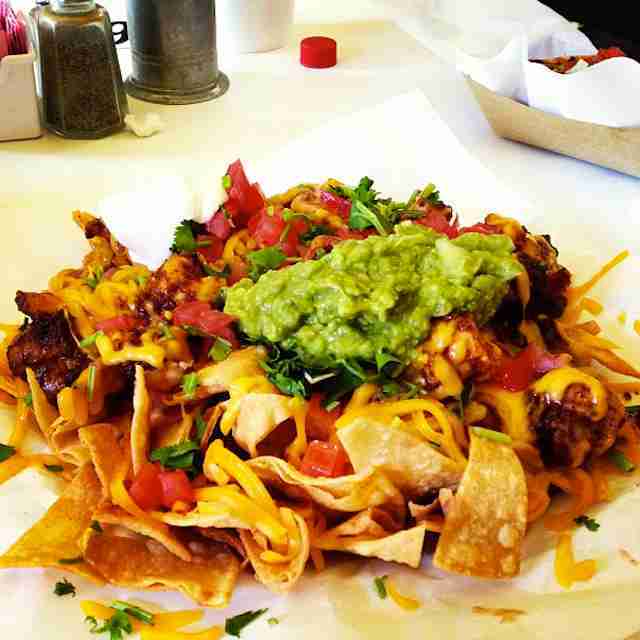 Here are the 12 best nachos in LA. Because the dudes who run the Lobos Truck love you, they invented Wachos, aka waffle-fry nachos. Same nacho goodness, but on a bed of delectable waffle fries. 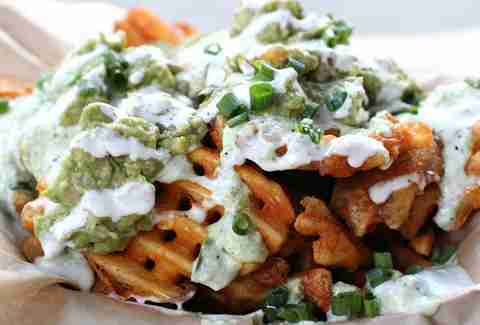 Try the Green Dragon Wachos, with Green Dragon sauce-tossed waffle fries, guacamole, scallions, and ranch. The precious angels at El Flamin’ Taco know exactly when you want nachos the most, so they’re kind enough to be found posting up outside of bars at closing time (especially Bigfoot Lodge). Long story short: your 3am can now come complete with carne asada nachos with refried beans, cheddar, avocado, jalapeños, and sour cream. 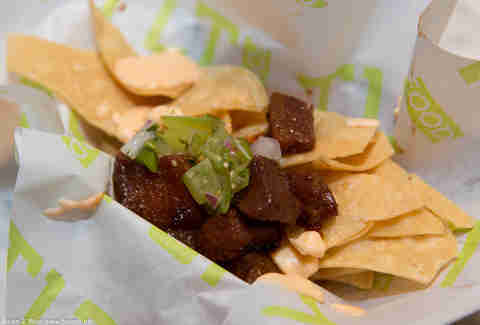 Any jabroni can get nachos WITHOUT braised pork belly. But only the jabronies who go to TLT Food can get nachos WITH braised pork belly, courtesy of Chef Daniel Shemtob who’s turned the Lime Truck into one of LA’s best ‘cho spots. This little family-owned joint has been ordained by Anthony Bourdain (Bourdained? ), and he wasn’t wrong to do so; you can’t go wrong with anything on the entire menu. 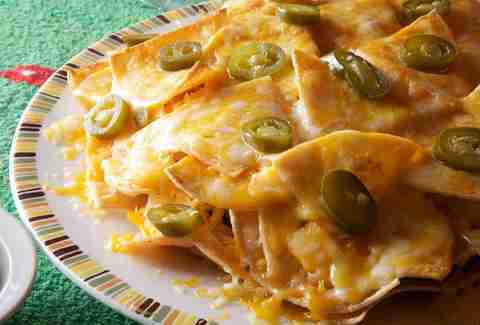 Grab the chilaquiles (breakfast nachos) and prepare for something special. Also, there's a chilaquiles burrito. Also also, cash only. Also also also, it closes at 2pm. SO HURRY UP! 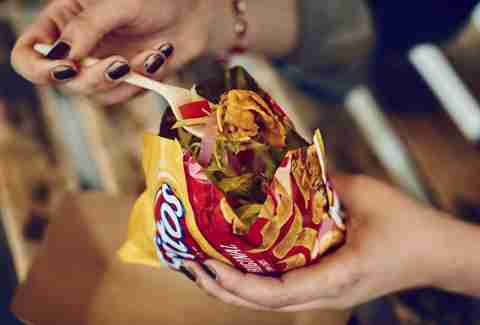 Fritos are chips too, bro, something HomeState realized right before it whipped up the magic that is the Frito pie in a bag; Fritos topped with chile con carne or black beans, cheddar cheese, lettuce, sour cream, tomatoes, pickled jalapeños, and pickled red onions. Y’all thought Fritos were a thing of the past? Not in Texas they ain’t. Not. In. Texas. 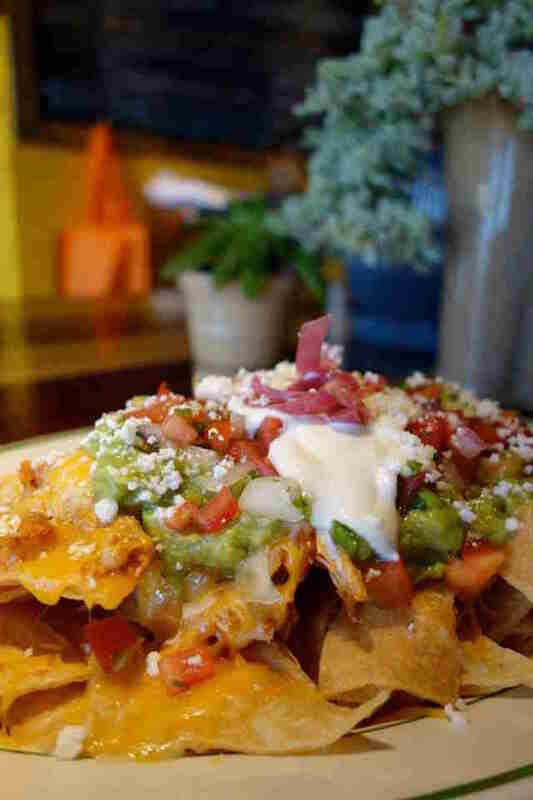 Just because artisan nachos exist, doesn’t mean you can’t stuff your face with the classics. 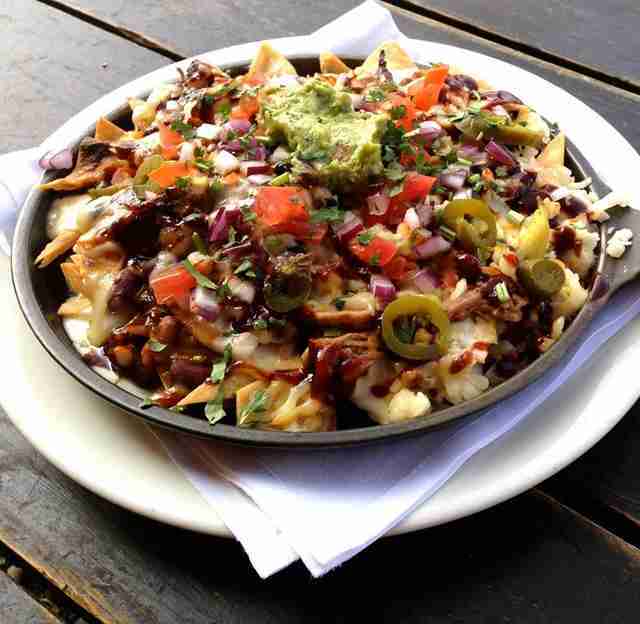 Plancha does some of LA’s best with old-school ground beef, nacho cheese, sour cream, salsa, and pickled jalapeños. 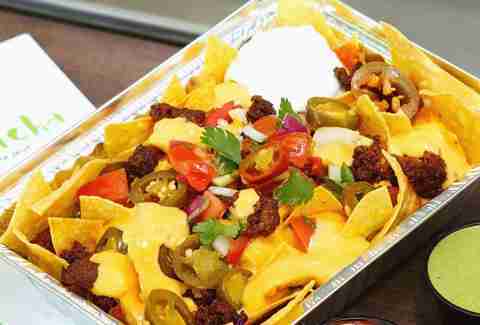 Like nachos? 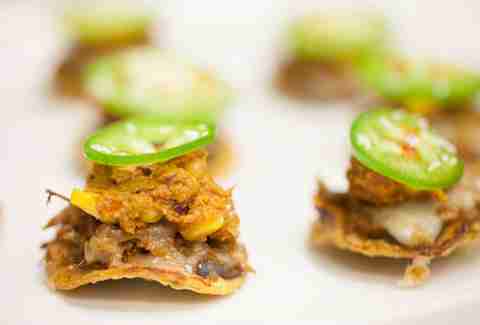 Well then you’re gonna LOVE lamb nachitos with BBQ braised lamb, black bean puree, yellow corn/olive tapenade, sweet pickled jalapeños, and two cheeses. We’re not worthy, Upper West. We’re not worthy. 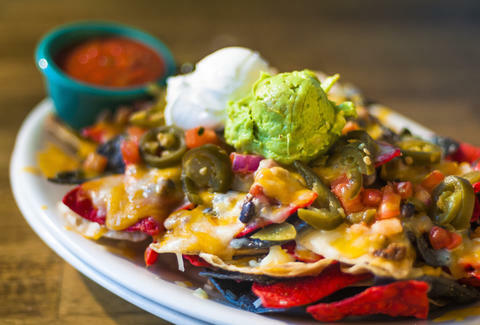 Carmen Rocha has long been credited with bringing nachos to Los Angeles, so like, it’d be disrespectful to not go and order some, ya know? It’s what Carmen would have wanted. House-made tortilla chips topped with BBQ pulled pork, four-cheese sauce, BBQ baked beans, smoked mozzarella, Jack cheese, tomato, red onion, guacamole, pickled jalapeño, and BBQ drizzle = your new favorite food/snack/afternoon tea. Tired of super-basic nacho toppings? Well feast your eyes... and mouth on what Sky’s has to offer: beef, chicken, turkey, shrimp, filet mignon (! ), crawfish (!! ), salmon (!!! ), tilapia (!!!! ), mahi (!!!!! ), and lobster (!!!!!!). Pick one (or all) of them, and then think to yourself... what a wonderful world. 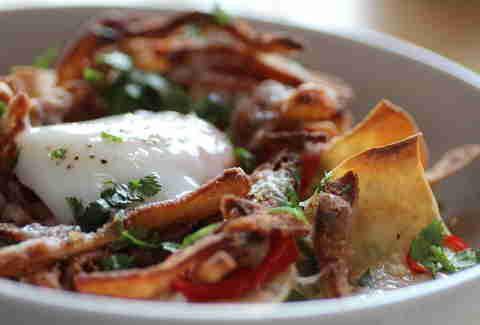 PCT has a shiny new location in the Arts District, and the pig ear nachos are dripping with excellence (not to mention crema poblana and a soft runny egg). Get over the whole pig ear thing and try them. #Trust. Wilder Shaw is a regular Thrillist contributor who has no problem saying his favorite chip on Earth is the tortilla chip. Argue with him on Twitter at @WilderShaw_ and Instagram at @wildershaw.